It is not often that lacrosse and steroids are mentioned together in the same news story. 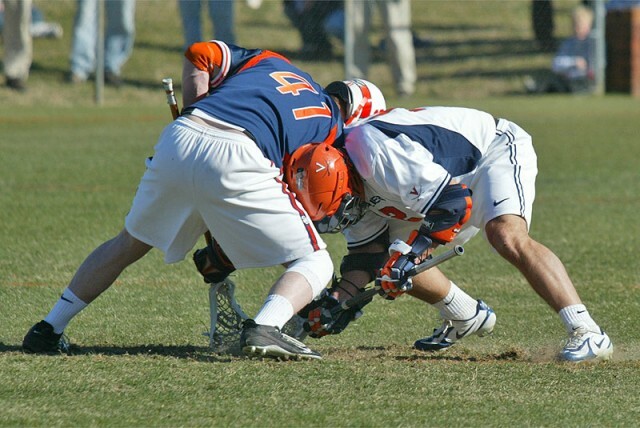 But lacrosse players may be the biggest users of anabolic steroids in college sports according to a Bloomberg report regarding the latest survey results of athletes participating in the National Collegiate Athletic Association’s (NCAA) 23 sanctioned sports. Or lacrosse player may simply be the greatest users of marijuana and cocaine. We’re not exactly sure. Bloomberg reports that lacrosse athletes led the country’s colleges in “the use of amphetamines, anabolic steroids, cocaine, marijuana and narcotics.” However, the report did not break down how the use of steroids compared to athletes in other sports. “[Lacrosse players] led all other sports in the use of amphetamines, anabolic steroids, cocaine, marijuana and narcotics,” according to the NCAA survery. The NCAA distributes the drug use survey among collegiate student-athletes every four years. Athletes can complete the survey anonymously and return them in a postage-paid enveloped provided by the NCAA. The latest results were compiled from the 2009 academic year and included 20,474 completed surveys. Fewer athletes were using anabolic steroids in 2009 than they were four years earlier according to the NCAA survey. The rate of steroid use decreased from 1.1 percent down to 0.4 percent. However, they were using more of most often drugs listed in the survey including alcohol, cigarettes, marijuana and “spit tobacco”. Bloomberg did not specify the actual rate of steroid use among lacrosse players or how it compared to athletes in other sports. They did specify the widespread of other drugs such as marijuana. Almost half of lacrosse players used marijuana (48.5%) compared to rates 0f 29.4%, 27.7 % and 26.7 percent among soccer players, wrestlers and football players, respectively. In addition, lacrosse players liked their cocaine too. About one out of ten lacrosse players reported using cocaine (9.7%) compared to 3.8 percent use in the next closest sport (ice hockey). It is hard to imagine that lacrosse players are more likely than college football players to use anabolic steroids. But it is not surprising that athletes participating in any sport where speed and strength are important would be tempted by steroids.